This is what I heard one of my friends say recently. No she’s not pretentious or snooty…she was just offering some candy (sweeties) to her child (darling). I’m sharing this little fun fact with you as an intro to today’s word post on all things sweet. Actually I’m going to focus on British puddings and I’m definitely talking about the sweet kind, not the savoury. Blood pudding? Can we all say ewww?! British puddings are fab-u-lous. And, just in case your pudd is not quite fab enough, well, the person serving it to you will usually ask if you would you like cream on that? Or custard? Or ice cream? And you would say yes. 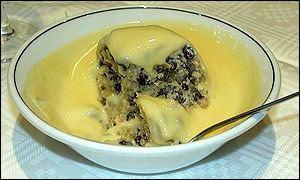 Because there’s only about 10,000 calories in the pudding so let’s go ahead and bring on the custard too. My goodness, the dairy products in this country are amazing. I could pretty much drink the double cream straight out of the carton. I don’t…but I could. There are so many wonderful pudds I’d love to mention that I’m feeling almost giddy just thinking about it. Let me start with my favourite…sticky toffee pudding. 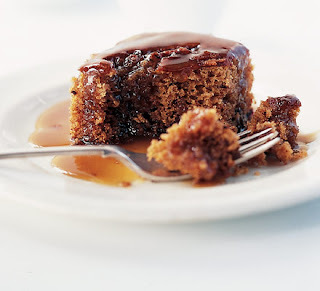 Sticky Toffee Pudding is a moist sponge cake made with very finely chopped dates and covered in a warm toffee sauce. The toffee sauce y’all…sigh. Gosh, maybe I should have saved that one for the end because I’m having trouble focusing on what to say next. 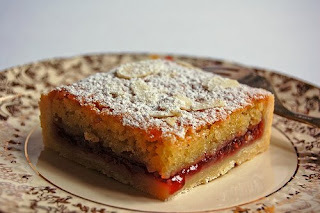 Oh yeah…I was going to tell you that the very first week I lived in England my next door neighbour arrived at my front door with a homemade Bakewell Tart to say welcome to the neighborhood. Except she said, 'Welcome to the estate' because that's what they call the neighborhoods here. She is originally from the town of Bakewell which is in Derbyshire so I considered her gift truly authentic. And delicious. A Bakewell Tart is basically a short crust pastry shell spread with jam (usually raspberry), and covered with a dense almond topping. Crumbles are a very popular dessert here and are made with whatever fruit is in season. My favourite is apple and plum and with some cream or custard poured on top it is ‘gorgeous’. You will often hear the word gorgeous used when describing food here. Somehow it works. If you saw the movie Calendar Girls you will recognize the pudd known as The Victoria Sponge. which incidentally was named for Queen Victoria. It was actually one of Queen Victoria’s ladies-in-waiting who is said to have been the creator of tea time which I’ll write about another day. A Victoria Sponge is a light and fluffy sponge cake sandwiched together with strawberry or raspberry jam and buttercream. A cake sandwich is definitely my kind of sandwich. Do I need to add that it is scrumptious? I thought not. I will mention here that if you plan to bake your own pudds in this country you really need to be prepared to face the sugar aisle of the supermarket. Recipes tend to be quite specific as to which type you should use …icing sugar (confectioners), caster sugar (very finely granulated sugar), Demerara sugar (raw sugar), brown sugar, muscovado sugar (a specialty very dark brown sugar with a strong molasses flavour) …Have I mentioned that I love England? I mean really, between the sugars and the creams what’s not to love? I don’t suppose I can end a post on British pudds without mentioning this one and before you say anything I know what you’re thinking. You’re thinking you had no idea you could get cake in a can. Okay, maybe that isn’t what you’re thinking but stop what you are thinking for a minute and think about that. You can get cake in a can here. 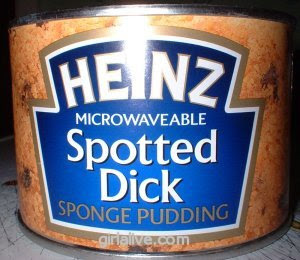 I’ve honestly never eaten one out of the can but hubs and I did have a little bit of fun (in addition to more than slightly embarrassing our teenage daughters) when we took cans of this one home to our brothers as stocking stuffers the first Christmas we were here. Finished giggling now? I suppose it does need a bit of explanation but it’s really just another pudd that you will see on pretty much every pub menu and in many restaurants here. Steamed puddings are popular and years ago you would have had to steam them yourself but now you can buy some of the traditional steamed puddings in the market and just microwave on a plate. Not quite the same but almost. The chocolate with the melty middle is my personal favourite because when you put your fork into it all this lovely melted chocolate syrup gushes out. What was I saying…oh yes, the can pictured above is a traditional steamed sponge pudding made with golden syrup, suet and raisins and like most other pudds here is best served with warm custard poured over top. Of course it is. The name possibly comes from a corruption of the word pudding (pudding became puddink which became puddick and you get the idea). Spotted refers to the effect created by the raisins. And on that note I think I really will end this post. You’re welcome. This past week has been a whirlwind of activity and emotion. We spent the week in the US house hunting, trying to picture life on that side of the pond once more… the towns, roads, malls, supermarkets, and oh yeah, my husband also has to think about his new job assignment every few seconds too. Prior to making the trip stateside I was feeling rather blue and slightly anxious about the visit and especially about what buying a house in the states means for me. It means I’m moving. And, a huge part of me has just not been too excited about that fact. There was also the small part of me that could get excited about repatriating but we’ve been in a state of limbo for several months now wondering if and when this was actually going to happen so I’ve not really let myself feel any excitement. But here we are. It is actually happening. Soon. And it’s really hard to explain out loud to friends and family how I am feeling about it all because pretty much all of our friends and family say, ‘Wow, you must be so happy and excited to be coming back to America finally.’ Well, yes. And no. Please don't misunderstand...in this economic climate we are truly thankful to have a job to move back to. I will say though that I have moved many many times in my life and it is not something that gets easier the more you do it. If anything I think as you get older it definitely gets tougher. So as we boarded our flight to the states last Friday I was maybe feeling a little sorry for myself and I might have let a tear slip as we pulled away from Heathrow and I tried to imagine how it will feel to make that trip and know I’m not returning in a week or two. It’s a very funny place I find myself in at the moment. This funny place I find myself in is actually what prompted me to start blogging. I hoped to write some about how I’m feeling during this time of transition in my life. When I moved to England I had two children living at home, one was only 13 years old. I am returning to the states to a new house in a new town with no children living at home. A repatriation counsellor has informed me I’m ripe for a mid-life crisis. Terrific. Not exactly the reassurance I was looking for when I attended the repatriation seminar. If someone had told me ten years ago that I would someday need to attend a repatriation seminar I wouldn’t have even known what in the world they were talking about. I had no idea there was an entire profession dedicated to helping people acclimate to a new country or re-acclimate back to their home country which will feel in many ways like a new country when you’ve been living away from it for years. I probably would have been thinking, ‘What’s there to get used to? It’s America…home…it will be a no-brainer.’ Funny how time and distance and life in another country can change your perspective. But here’s the thing…we really loved spending time this past week in the little town in North Jersey where we’ll be living once we get moved. And y’all… you do kind of forget how friendly Americans are. And I’m not saying people aren’t friendly in England but it’s not the same sort of friendliness you encounter in America. Everyone talks to you. The waiter, the person filling up my car, the man in line behind me at the post office, the bank teller, everyone. And they all seem to be rooting for me. They want me to love moving back, to love living in America once more. And I will. So we enjoyed our week, felt overwhelmed in the shops, only tried to get in the car on the wrong side once or twice or everyday, bought a beautiful house in a lovely town, ate real New York style pizza and some awesome Mexican food, ran into some old friends, soaked up the sunshine, smiled at the deer we saw in someone’s yard, admired the very pretty views of the mountain ridge and valleys (hey, they don’t call it the Garden State for nothing! ), talked about the fun we’d have popping in to New York City, and the list goes on. We got on a plane back to England Friday night feeling pretty happy and also excited about our future plans. We arrived at Heathrow Airport early Saturday morning. You have to love a country where you can be in an airplane and have clouds so thick that you have no idea you’re touching down until the wheels actually make contact with the runway. And we picked up our pup at the kennel and chatted with the owner there for a few minutes about how darling our dog is and how her underbite gives her character. And we walked thru our front door into the charming English house we have lived in for 6 years. And I opened the curtains in my kitchen and saw my garden and all that had popped open in it while I was away. And it is truly beautiful and a sight I never get tired of seeing. And I ran into Fishers which is our local market, and the checker asked if I’d been away. And then today we went out to see the ‘car guy’ who has been working on my husband’s little MG while we were out of town and when my husband told him we were moving back to the states the car guy who we’ve dealt with for years actually got a little teary. And he gave me a big hug. And between the emotion, the exhaustion and the jet lag I contemplated for a minute collapsing into a puddle on his driveway. Soon this side of the pond will be that side of the pond. Do I change my blog title? No, I don’t think so. The verses at the top of my blog are some of my favourite and have come to mean a lot to me especially these past few years as we’ve settled on ‘the far side of the sea.’ When we moved to England it was easy to feel that was precisely what we had done. I guess I just never thought that in re-settling in America, my home country for a time will also feel like ‘the far side of the sea'. I know I've written more than once about all things related to driving in England but I also said I could write a novel on that topic. And, I’ve noticed a few things as we’ve been out and about on the motorways this week here in the good ole USA. For one thing the motorways are wide. And if we were talking hips that would be a bad thing but we’re talking interstate highways and wide is a very good thing. In England the high speed roads are called motorways and are numbered much like the interstates are here. So you might hear me say something like, ‘ We almost missed our flight to South Carolina last summer because we sat on the M25 for several hours while the policemen tried to talk down a man dressed as Batman who had climbed out on the signpost over what is one of the busiest motorways in the world.’ True story. The car parks are wide in America too. And by car park I mean parking lot. The spaces are wide and that lane between each row of parking spaces is really really wide. And you can swing a car door open and not hit the car beside you. I shop in Windsor quite often and their car park has to be one of the absolute worst (Think Gene Hackman in The French Connection). I actually have to let any passengers out of the car before pulling into a space because the spaces are so narrow. And I have to inhale deeply and hope the trips to the gym are paying off in order to get out myself. True story. The word circus is not used in connection with driving in America. When I think of a circus I think of lots and lots of activity, bells and whistles and flashing lights and people and animals and craziness. In the UK the term refers to an intersection in town with several streets converging…if you’ve been to London you’ve probably seen the signs for Oxford Circus. Hillingdon Circus was not too far from the school my girls attended so I found myself there quite often. Actually, now that I think about it the word circus makes perfect sense. And you might hear me say something like, ‘I want to avoid driving anywhere near that circus.’ And you can define the use of the word 'circus' there whichever way you prefer. True story. And I know there are cameras placed in certain intersections here in America but the UK is home to the bright yellow box known as the speed camera. Not all of them are yellow but they are easy to spot. And in all fairness you get plenty of warning when you are approaching a speed camera zone. There will be a picture of a camera signposted before you actually get to the camera. Then there will be white lines painted across the road while you travel thru the speed zone. The camera itself is a big box. And, if you still miss it they kindly send you a photograph of your smiling self driving thru it. You'll actually only get to see your photo if you happened to drive thru the camera a little too fast and they need to attach said photograph to a citation. True story. I’ve also noticed that in America drivers don’t seem to pay a lot of attention to driving in the proper lane. (As an aside, my entire family uses the word ‘proper’ a lot. It’s another one of my favorites. As in I need a proper nap. I need a proper meal. I’d love a proper holiday on one of the Italian lakes. True story.) In the UK if you want to drive slowly you do not drive in the fast lane. Which of course is the right lane in Britain, not the left like in the US because remember we’re on the right side of the vehicle and on the left hand side of the road so you’re fast/slow lanes are also reversed. Everyone clear? Thought so. When you're driving on the motorways whether you're here or there you want to stay off the verge. And watch out for the articulated lorries too. If you have difficulties look for a layby. In other words...keep off the shoulder, watch out for the semis and if you have difficulties look for a paved area at the side of the highway designated for drivers to stop in or where vehicles may park in an emergency. In the UK some of the laybys actually have food vendors and you might be able to grab a sarnie and ribena for the road. That would be a sandwich and a ribena. Sorry ribena is ribena, a black currant juice drink super popular here as are all things black currant flavored. Not really much grape here. Even the purple Skittles and purple Starburst candies are black currant (btw-eww!) Oops I forgot... this post is about driving words not eating and drinking words. Next Wednesday I'm writing about British pudds....I think I can say in all honesty that is one area in which I consider myself an expert. True story. Wow, two posts in one day-this is a first for me. It was either write another blog post or go to bed at 6:30 and since I know I need to get into this time zone I went with the blog option. Plus I read some comments and feel like I need to clarify what's happening with us. Yes we are moving back to the US after 6 years in the UK. We don't know the exact timing of the move but expect it all to happen at the start of summer. We will be living in Northern New Jersey. We lived in this area many years ago and in fact my youngest daughter was born just across the border in New York state. I love the New York City skyline. We aren't moving to the same town that we lived in before but I still feel like I'm in some sort of time warp and images of my now 18 and 20 year old daughters in their toddler years keep popping into my head. There is alot of informercial programming on US television. Okay maybe that last thought has nothing to do with anything but it's so true. Speaking of television, The Miss USA pageant just came on and what's up with that? It has an icky Las Vegas showgirl vibe happening. Moving house, moving country, Miss USA is getting a 'green crown' whatever that means. In the words of Bob Dylan people ...'the times they are a-changin'. So turns out house hunting is exhausting. We had our first full day of looking yesterday and I'd been awake since 1:30 am so I probably wasn't at my very best. I tried to sleep Friday night..I really did. My husband managed to sleep and since I didn't want to wake him up I finally took my book and decided to lay down in the bathtub at about 3:30. It was the only place to stretch out and turn on a light. We left the hotel at 8 am to meet our realtor and we arrived a little bit early so we drove around the little town we think we'll eventually be living in and we walked up to the lake and I remembered how much I love living near the water. We viewed nine houses yesterday and things get a little blurry after that. We finally headed back to the hotel about 4 but my husband, who is just never tired and always has an endless supply of energy, felt the need to pull into every car dealership we passed 'just to look'. Actually buying a house is just the tip of the iceberg when it comes to moving back. We will have to buy cars too. And televisions. And a refrigerator. And a washer and a dryer and about 20 thousand hundred other items. And did I mention we have two kids in college? And it might have been somewhere around the third car dealership that my husband says 'Mean Joyce' came out. And apparently Mean Joyce convinced hubby that we should go back to the hotel 'straight away' as they say in the UK. I sat down on the bed for a nap at 5 PM and woke up at 5 am this morning. Much better now. We're meeting our realtor again this morning for round 2 of looking. I'm sure we won't be seeing 'Mean Joyce' at all today. Pretty sure anyway. Our luggage-remember the old Samsonite commercials where a car drove over a suitcase or an elephant stood on top of it and the suitcase still looked good as new? Well that's not ours. People really make themselves at home in a big way in the British Airways lounge. You can take a polo gap year...really....in Argentina. Who knew? I learned this reading an in flight magazine. Taking a gap year is a hugely popular thing to do especially among the European kids. They typically take a year off following the end of highschool or the end of university and travel the world and have awesome experiences. My husband says he'd like a gap year. And he'd like it now please. Walking into the International terminal and seeing Welcome to The United States of America makes my heart sing. And seeing that sign and hearing the Immigration Agent say 'Welcome Home' makes me want to leap across the desk and give him a big hug. But I don't because they are actually kind of serious in immigration. Riding the tram between the terminals at the Newark Airport feels a little bit like Disneyworld. Except with lots of aggravation and not all the fun stuff you get at Disney. And my husband is so anglicized he doesn't even realize he told the co-worker he phoned from the airport that we had arrived and were on the way to 'hire a car'. In the UK it's always a car hire but I'm petty sure it's still called a rental on this side of the pond. And when we get in the 'hire car' my husband says, 'Don't let me drive on the wrong side of the road.' And I don't. I'm going to have a real pizza for dinner tonite. Pizza is different on our side of the pond so this is way more exciting than it might sound. I can love both sides of the pond. And I do. What is a bap? Essentially this is a hamburger bun. There are lots of sandwich shops here and in fact there is one in our little village called ‘Mrs. Crusty’s –does that sound appetizing to you? Me either. In fact my kids refused to set foot inside based solely on its name. There’s a ‘Mr. Crusty’s in another nearby town. Actually they make excellent sandwiches and when you order they usually ask if you want your sandwich on a bap, granary roll, baguette or bread. If you respond with bread they’ll ask white or brown? And then they usually ask, ‘Do you want salad on that?’ and if you’re American you’re thinking, ‘ewww, no, why would I want a salad on my sandwich?? ?’ which helps explain why, when my daughter ordered a BLT, she ended up with a ham and tomato sandwich. Let’s break it down shall we- there are three key ingredients to a BLT hence the name. First there is the b for bacon-well now unless it is unsmoked streaky bacon then its generally back bacon which is delicious but doesn’t have that Oscar Meyer taste if you know what I mean. Tastes much more like ham. Next comes the l for lettuce. Supposedly. When my daughter ordered her BLT the server asked, ‘Do you want salad on that’ and of course she said no thinking l is for lettuce right? But, because she said no salad there was actually no l at all on the bLt. Do you see the problem? She did get tomato and a tomato is a tomato here except you must say to-mah-to. It’s the law. And all this talk about salad brings me to another word I mentioned last week and that word is rocket and it’s got nothing to do with outer space and everything to do with salad. Rocket is what Americans would call arugula and it is delicious and wildly popular here. Perhaps you would like a white coffee with that sandwich? Or more commonly you will ask for a coffee and the server will ask, ‘white or black’? If you’re like me you’re thinking neither…I’ll have a coffee with a little cream…which is indeed a white coffee. Maybe you’d like a digestive biscuit with that white coffee? That may sound like something for an upset stomach but it’s not. Cookies are called biscuits here and a digestive biscuit is similar in taste to a graham cracker. I’ve crumbled them to use as a substitute for a graham cracker crust in my baking here since we don’t have graham crackers. Completely coincidental to this post my husband and I actually ‘rocked up to a restaurant for a Ruby Murray’ this evening. Ruby Murray is rhyming slang for a curry and rock up means to arrive. If you’re going for a curry you just might use this expression. I’ve never actually said it myself until now but you might. I have however eaten curry. Lots and lots and lots of curry. My little family here, well, we all love Indian food and I know lots and lots and lots of you are turning up your noses at the mere thought of Indian food and thinking you don’t like it but there are many delicious dishes and all levels of spice. My husband always gets a small side plate of diced chillies because too hot is not in his vocabulary. Daughter2 orders exactly the same dish every time…butter chicken. This is chicken swimming in the most delicious sauce you’ve ever tasted, so creamy… just like butter. And I am completely addicted to the Peshwari Nan which is Nan bread (flat bread) with coconut filling. Kind of like eating coconut pie with your dinner. We have our favourite local spot in town and we eat there at least every other week. And they treat us like celebrities. It’s such fun truly because when we moved here we dined in this restaurant and they treated us very coolly at first. Just a head nod when we came in. After some months went by we graduated to a small handshake. And now, six years later we get the owner kissing me on the cheek and every waiter in the place stops by our table to shake hands with my husband and greet us. And if my husband and I ever went in with only one of our daughters they would worry…. ‘Where is the miss?’ they would ask. And now that our girls are both away at uni they always ask, ‘You miss your daughters?’ And by the way, the answer to that would be a YES! They like to see our family all together. (Me too!) I think our experience over time in this little Indian restaurant has taught all of us really important lessons about people and culture and etiquette within different cultures and prejudice and friendship and of course, food. I haven’t even begun to talk about my favourite thing…the pudd. Or pudding as it is called here. The term pudding can go about 10 different directions-I might be talking about Black Pudding but I probably never would (it’s also referred to as blood pudding). I might mean Christmas pudding which is similar to a fruit cake and is doused in brandy or rum and then lit afire and is really quite fun. I could mean Yorkshire pudding and I heart Yorkshire pudding which I’d say is kind of like a Pillsbury biscuit but not really. It rises high and fluffy around the edges and is usually served with roast beef and drenched in gravy. Did I tell you I heart Yorkshire pudding? Most likely though if I say Pudding I’m referring to the dessert section on a menu which is generally just headed Puddings but covers all sorts of cakes, tarts, and assorted other goodies including jellies. Now I could write a whole post on this and in fact I think I will. Except it won’t be next Wednesday because I’m travelling next week and we all know that puddings will require some photos and probably I’m going to need to do some tasting purely for the purpose of blog authenticity so puddings will be in two weeks time. No worries though…there are plenty of topics to choose from for next Wednesday…healthcare, housing, education…sounds slightly political doesn’t it? Oh, that’s another one…government. Words are everywhere y’all! I'm thinking now these word posts may never end. I’ve posted this picture especially for Daughter1…mussels are her absolute favourite. And Belgians claim to have invented the ‘french fry’ and may I just say they have those down to an art. Mussels and fries or moules et frites are served in just about every restaurant in Belgium. They always serve their frites with mayonnaise and they are yummy. Good Friday we woke to sunny skies and after breakfast we hopped on a train to the town of Ghent. We took the first train we could find that said it stopped in Ghent but turns out it also stopped in about 10 other little burgs in the Belgian countryside so it took a little over an hour to get there. It was that darn language thing….we managed to decipher which was a quick train back to Brussels at the end of the day and it was only about 40 minutes. Course I insisted we ride the tram from the centre of Ghent back to the train station and that took us on a circuitous route around the city. As my husband mentioned (about 25 times) we could have just taken a taxi. He says tram is short for ‘Trying Reallyhard to Annoy Me’ but we did see a lot of the neighbourhoods around Ghent this way and it was great for people watching. Ghent is a charming Flemish city filled with medieval buildings and famous for its huge gothic cathedral and its ancient Castle of the Counts. The River Leie runs thru Ghent and is dotted with the pretty old guildhouses and lots of restaurants and cafes with outdoor seating. Our first stop was the castle-Het Gravensteen built in 1180 although apparently a wooden castle was sitting on this same spot even earlier. It was home to the Counts of Flanders until they were no more and was later used as a courthouse and a prison. Castles becoming prisons is a recurring theme in Europe. We wandered next down to the incredible Gothic cathedral known as St. Baafskathedraal, built in the 1200’s. In a small side chapel inside this cathedral is one of Europe’s most well known paintings. The Adoration of the Mystic Lamb by the brothers van Eyck, dating back to 1432, but with color so amazingly clear and bright it looks like it was painted yesterday. It is essentially the perfect painting to view on Good Friday as the centerpiece of the many panels is the Lamb, representing Christ’s sacrifice. On Saturday (also bright and sunny and as I’ve mentioned before I’m all about the weather) we ventured onto the local trains once again, this time to the city of Bruges. This very lovely little town was at one time the center of the international cloth trade and lace making is still done here today. Like Ghent, Bruges is also a medieval town with beautiful buildings, cobblestone streets and picturesque canals winding throughout…we spent the day visiting lovely old churches, shopping in the quaint little shops, and sitting in outdoor cafes just watching the people go by. We were back in Brussels for dinner Saturday evening. There is a famous street in Brussels called Rue des Bouchers but what we might call restaurant row. Servers stand in all the restaurant doorways and try to coax you inside for a meal. Since my husband is in Brussels quite often we went to a place called Vincent’s. One of the things I love most about my husband is that he makes friends wherever he goes and Brussels is no exception. This is our server for the evening standing beside my husband’s new Belgian friend whose name is Steve (although he told me I should call him Steve McQueen). Anyway, we were going to eat at Vincent’s on Thursday evening but Steve McQueen told my husband he was going carp fishing that day and we should come Saturday instead. So that’s what we did. We had a traditional Belgian steak which was served with a sauce that was flambéed just before presentation. A perfect ending to our ‘short break’ in Belgium. ...they are always way too short! My hubs travels to Belgium fairly often on business and since he was there last week for a meeting we decided to make a weekend of it and I would join him. They have a name for trips like this in the UK-they are called ‘short breaks’. Good Friday and Easter Monday are ‘Bank Holidays’ here which essentially means banks are closed as are most businesses. I caught the Eurostar from London to Belgium last Thursday-it’s a fast train and from the center of London you can be in the center of Brussels in only two hours. I’d love to tell you something interesting about the train journey but I pretty much sat down, listened to some instructions in English and woke up 2 hours later to someone speaking French. The Eurostar goes under the channel and the idea of that freaks me out a little bit so I love napping the journey away. If I’m being honest I pretty much love napping anytime. We stayed in a hotel in Brussels and then took local trains to the towns of Ghent and Bruges over the weekend. I’m going to write about those cities in part deux of this post. Belgium is unusual in that two languages are spoken and what you hear will depend on where you are in the country. Some areas are French speaking and some are Flemish. Let’s just say that trying to navigate trains and timetables in Flemish adds an element of adventure to the whole experience. We’re very comfortable travelling around over here but even so we forget sometimes that English is not used everywhere…you do remember that fact pretty quickly however when you are standing in a train station in a foreign city trying to get to another foreign city and none of the signs have anything even remotely like English on them. I’m always impressed at the ease with which my friends from other countries are able to switch between the two, three, or four languages they speak. Impressed and a little bit envious. Multilingualism is a skill I wish I possessed. And little booths making smoutebollen which are sugared donuts, and in fact the whole shopping street closest to the Grand Place smells like someone’s mama has just pulled a tray of sugar cookies out of the oven. Good thing we walked about 45 miles this weekend. The Grand Place is the main square in Brussels and it is magnificent. Beautiful buildings all the way round with lots of outdoor cafes where you can sit and enjoy the view. The centrepiece is the Hotel de Ville which is Brussels Town Hall. The spire on this building was built in 1449 and stands 315 feet high. It is also slightly crooked. More beautiful buildings flank the Hotel de Ville including Le Renard which was at one time the guildhouse of the haberdashers and La Maison des Boulangers with it’s very beautiful dome topped by a dancing golden figure and also Le Roi d’Espagne which offers a great view of the square. Of course we walked down to the very famous Manneken Pis which is a funny little statue of a boy happily relieving himself into a small pool outdoors as little boys everywhere apparently love to do. There are a few theories as to how this statue came to be but one of the most popular says that during a battle sometime back in the 1100’s the troops put the young son of a duke into a basket and then hung the basket in a tree to encourage the men. From this tree the little boy relieved himself onto enemy troops who eventually lost the battle. This is probably a whole lot more than you want to know about the little statue but it is a must see for everyone who comes to Brussels. In fact the Manneken has taken on a life of its own now and at different times of the year is dressed in costumes from around the world. Heads of state visiting Brussels have been known to bring miniature versions of their national dress for the statue and he now has over 400 outfits including an Elvis costume. And I’m thinking that anything I write now cannot possibly compete with a cheeky little boy statue with his own Elvis costume so I’ll save the rest of our short break fun for tomorrow’s post. Last week I wrote about the seemingly small but significant communication gap that exists between British English and American English. I’m planning to devote my Wednesday posts to this topic for the next few weeks. I’ve been thinking about how best to condense the information because whole dictionaries have been written attempting to do just that and once I really got to thinking about it all I felt just a tad bit overwhelmed. I mean, do I want to write about words we both use that have completely different meanings depending which side of the pond you stand on? Take the word pants for example. The first time I stepped into my local dry cleaners there was a young man working behind the counter and the shopkeeper was also there but was busy tagging laundry. I was just another anonymous customer until I said, ‘I’d like to leave four pair of pants for dry cleaning please.’ That certainly got their attention. I knew instantly I’d said or done something wrong but what??? As I eventually learned pants are always called trousers here. If you use the word pants then you’re talking about underwear (pants is short for underpants). It took me a while but I can now walk into my cleaners with confidence and say ‘I have four pair of trousers and two jumpers to be cleaned.’ The words just roll right off my tongue. And, oh by the way, jumper is another one of those words. What I call a sweater in the states I would call a jumper here. At least I would if I wanted to be understood. You might say British English and American English are as different as chalk and cheese. Or you might not if you’re an American reading this because that isn’t an expression used in the states. So, do I want to write about phrases used here that you never hear in America? That has real possibilities too. I love the phrase ‘spot on’. As in, ‘wow, your post on this topic is spot on!’ In other words, exactly right. I didn’t need to explain that one did I? I’ve decided the easiest route will be to go topic by topic…words and phrases used in different parts of everyday life. So if you want to know how I would answer commonly asked questions relating to eating, food shopping, and cooking such as ‘Would you like a white coffee?’ or ‘Would you like salad on that sandwich? and ‘Did you want it on a bap?’ then your curiosity will be satisfied next Wednesday when I’ll blog about all things food related. If you’d like to know why rocking up to a restaurant for a Ruby Murray is one of our favourite things to do here then I’ll explain that too. And, if you think a digestive biscuit has something to with settling your stomach or you think jelly is jelly and pudding is pudding then you definitely need to stay tuned. And about these Wednesday posts… I do realize this one is a bit dodgy, filled with bits and bobs. But please don’t get your knickers in a twist. I’ll have it sorted Wednesday week. And one more thing…I often sign my posts with the word Cheers and I know some of you are thinking she drinks when she blogs. I know I have always associated the word Cheers with clinking glasses. But the word Cheers in the UK is also used as an informal way of saying thanks or goodbye. I hear it at least 5 or 6 times a day here and using the word has become automatic. Do I ever get a funny look when I say it? Only when I’m on that side of the pond! My husband and I went in to London on Saturday to hang out because we’re empty nesters and we can do that. Sometimes we have an agenda but a lot of times we just hop on the train and start walking and see where our feet (and the Tube and those fabulous London taxis) take us. Oh, and the weather…always thinking about the weather. Saturday was one of those spectacularly crystal clear days and oh how I love to see the sunshine here. Trains run from our village into Marylebone Station and we can get on the Underground from there. We rode the tube as far as Piccadilly today where we came above ground and started walking. And as were walking down Piccadilly Street we heard music. It was someone with a terrific voice too. We came round a corner and there he was…The Singing Handyman. You just had to laugh. The Singing Handyman drives around town in his panel van that advertises his handyman business which is the usual type of handyman work like plumbing and electrical repair. What makes him unusual though is that he also has a microphone with speakers attached to his van and as he drives around the city he sings. Loudly. When we bumped into him he was just wrapping up that disco classic, Love is in the Air, and was transitioning into Daydream Believer. Several years ago my husband attended a sales training event of some sort where the comment was made that if you give people bubbles they smile. And I guess happy people buy things so give them bubbles and make them happy and you’ll get the sale. Now, I may not have that exactly right (and I’m pretty sure I don’t) but I will tell you that besides the fantastic singing there were bubbles pouring out of The Singing Handyman’s truck. Kind of like a rolling bubble machine. And yes, we smiled. And then we went shopping so maybe I did have it right. We headed to a little shopping area on Piccadilly Street known as the Burlington Arcade. Now, when I hear the word arcade I think pin ball machines, skee ball and prize tokens but The Burlington Arcade is more like Ralph Lauren, Rolex and handmade French macaroons and it’s a great place to window shop. Also a great place to buy stuff : ) The Burlington Arcade was Britain’s very first shopping Arcade (1819) and is the longest covered shopping street in England and possibly the most beautiful. Since 1819, the Arcade has been protected by the Beadles who are guards in the traditional Edwardian frock coats and gold braided top hats. They were originally in place to enforce a strict code of behavior in the Arcade which included no whistling, singing, playing of musical instruments, running, carrying of large parcels or opening of umbrellas and no prams (strollers as the Americans say). Today they are the smallest private police force in existence and they continue to patrol the Arcade and keep shoppers from running with large parcels while pushing a pram with an open umbrella? After some shopping we walked just a couple of blocks, stopped in Marks and Spencers to pick up a picnic lunch and then headed to Green Park. One of the things I love about the city of London is all its green space. There are beautiful parks scattered all over the city and Green Park is the one adjacent to Buckingham Palace. For a small fee you can rent comfy chairs-we paid £3 (or $4.50) to use two chairs for 2 hours - and we planted ourselves amidst the daffodils and other folks who had the same idea. We joke here that we are Vitamin D deficient but really we’re only half joking. It was so nice to sit and feel the sun on our faces and it wasn’t too bad either to catch a glimpse of Buckingham Palace thru the trees. After we packed up we walked some more, thru the magnificent park gates, past the Palace and into St. James Park, another beautiful green space that sits in front of Buckingham Palace. We stopped for an ice cream and this is Cadbury country so when you get a cone they ask you, ‘flake or no flake’? and I of course always say flake because they are scrumptious. It’s basically a flaky Cadbury chocolate stick. Who wouldn’t want that?? And, then we walked some more. We came out of St. James Park behind No. 10 which is the Prime Minister’s home and then we walked just a bit further towards Westminster Bridge and Big Ben. I absolutely never ever get tired of looking at Big Ben. I went on a tour once and climbed a billion steps and actually stood just behind the clock face and got to put my hands on the steel beams inside as the bells tolled and the whole thing vibrated and made your ears hurt but you didn’t even care because you were standing right behind the face of Big Ben. They used to allow tourists up but now it’s just for residents and you have to arrange it through your local MP (Member of Parliament) and only 15 people at a time can go up but it is so worth it. And then we walked some more. We headed down Westminster towards Trafalgar Square and sat at an outdoor café and had a cup of tea and rested our aching feet and did a little people watching. And we decided we’d seen absolutely every form of dress known to mankind including winter boots, a bathing suit top, and a tuxedo. And then we walked some more, over to Leicester (pronounced Lester) Square which is the theatre district and on into Chinatown. We had a lovely dinner at a Chinese restaurant before walking just a bit more to catch our train back home. 'Well, it's ok. It's so nice. I’ve lived in the UK for so many years now that, as strange as this sounds, I sometimes forget I have an American accent. Quite often someone will ask me where I’m from and when I reply with the name of our village here they give me a funny look that tells me something didn’t compute and then they say, ‘Yes, but where are you from originally?’ Oh yeah, I’m from America. Now, let me just state for the record… I love America with all my heart. When you are in a country far from home and you hear your National Anthem played the tears come and you feel such a combination of love and pride and homesickness you don’t know what to do. There is nothing like living in a foreign country to give you a new found appreciation for all that is wonderful about your own home country. Let me also say for the record…I love England too. Because there is nothing like living in a foreign country to give you an appreciation for all that is wonderful all around this whole great big wide world. Along with my American accent comes an American vocabulary which you might be thinking isn’t all that different from a British vocabulary but you might also find you are seriously mistaken. Shortly after we moved here I stopped by our local train station to pick up a ‘schedule’ of trains running into London (and no, I did not say shedjul in that posh English accent that I love). There weren’t any available on the display rack so I asked the man behind the counter if he had any more schedules behind the desk. And his reply was this, ‘No, we don’t have any schedules.’ (and he might have said it shedjul) Now in my American brain I think that means they ran out but then he says, ‘Do you mean a timetable because we do have timetables.’ Big sigh here because sometimes communicating is exhausting and I know we speak the same language but y’all we quite often (as in every single day of my life) don’t speak the same language. Entire books have been written on this very topic and we personally own three different versions of British-American Dictionaries. Did you even know such a thing existed because I certainly hadn’t thought much about it before moving here? When we were told we were moving to the UK I’m pretty sure that the language was one of the things that went into my ‘pro’ column…you know, at least we speak the same language. However, upon our arrival I was completely gobsmacked to find that wasn’t the case. Actually it’s a stretch using the word gobsmacked in that sentence but it is maybe my favourite word in the entire universe and I’ll probably use it again now that I’ve put it out there. It’s a combination of gob (mouth), and smacked. It means utterly astonished and it’s much stronger than just being surprised. It’s used when something leaves you speechless. ‘A dog’s breakfast’ would also be near the top of my favourite expressions here. This is a term used to describe a real mess, a hodge podge of things as we might say in America, although my girls tell me no one says hodge podge except me. Nor does anyone use the word ‘hip’ but I digress. My hubs might say that my kitchen junk drawer is ‘a real dog’s breakfast’. This is not to be confused with a dog’s dinner which has an altogether different meaning. And that meaning has nothing to do with dog food either. Words are tres fun here. I think for the next little while I am going to devote my Wednesday posts to British-English and I think I’ll call it Words on Wednesday -British English Words from A to Zed. Because ‘z’ is always zed here And ‘zero’ is always nought here. And an eggplant is always an aubergine and undies are always knickers and a bandaid is always a plaster and boy does this post have a whole lotta potential! I’m going to sign off now because my brain is swimming just thinking about all the possibilities. As my friends here would say...I’m shattered. (That would be absolutely and completely exhausted in case you’re wondering).